It is a great time to be a political opposition entrepreneur in Japan. The official opposition parties, aside from the Communists, are busily killing themselves off. Feeling left out from the circular firing squad jamboree, the Japan Restoration Party (Nippon Ishin no Kai) -- whose co-leader Ishihara Shintaro had an intimate dinner with Prime Minister Abe Shinzo on Saturday at the PM's villa in Yamanashi -- seemingly yesterday set out to divide the party into pro-Ishihara and anti-Ishihara splinters. Or at least, that is what logic would tell a person of average intelligence. In terms of party leadership, JRP co-leader and Osaka Mayor Hashimoto Toru has been a man of two hats. He is co-leader of the national party, which only has Diet members as full members. He has also remained the leader of the Osaka Restoration Party (Osaka Ishin no kai), the regional party whose members are prefectural and municipal elected officials of the Kansai region. Matsui-san, I can understand you are in denial about the rapid diminution of your national status whether you stay an acolyte of Hashimoto or seek your fortune with Ishihara as he plays footsies with the securely Abe-led LDP. Nevertheless a lack of emotional preparation does not preclude you from acknowledging reality. To be fair, Matsui has probably been feeling out of the loop ever since Sakaiya Ta'ichi, Hashimoto's chief advisor on administrative restructuring, accepted absorption into the Abe advisory team (Link). Prior to the Sakaiya appointment, Matsui had probably convinced himself that come what may, the Abe Cabinet would be approaching him (Matsui) rather than the more problematic Hashimoto at deal-cutting time. As for the grander picture, one cannot escape the impression that the unstable opposition parties are at the event horizon of the grand black hole of the renewed LDP. Not a few members of the opposition, such as former Sunrise (Tachiagare Nippon - literally, Get Up, Japan!) 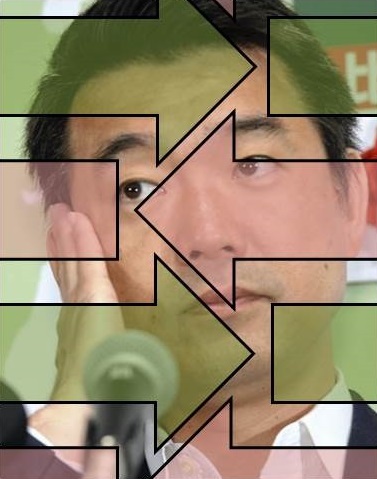 Party chief Hiranuma Takeo, whom Koizumi Jun'ichiro expelled from the LDP in 2005, would love nothing more than to march, head held high, into LDP without conditions. Others in the JRP, the Your Party and the DPJ are ideologically and temperamentally indistinguishable from LDP members. Why retain the artificial boundaries in between the Diet members, save out of a pathetic, anachronistic respect for the will of voters as expressed oh, when was it? Oh, yes, last month. With undoing of the bonds knitting the opposition party members, a fair number of Diet members are likely to be sucked into the black hole. The rest are likely flung out into the cold, their hopes and parties identities shattered. Last month, a few days after the election, I was asked an Economist Conference event about the possible re-emergence of a 1.5 party system, this after the seeming failure of the 15 year-long experiment in an emerging 2 party system. My response was typically pedantic, long-winded and contrarian. The gist, though, was that a 1.5 system would be a pipe dream for the current opposition. What we have to talk about after 21 July 2013 is a 1.0 party system, with no appreciable opposition at all. Would I be far wrong in dropping the qualifier "appreciable" from my late July assessment?